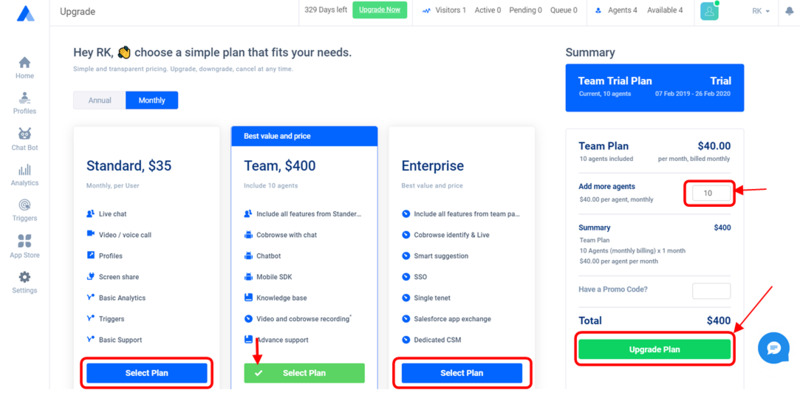 To upgrade your plan, just click on Upgrade plan button, Once you click on it you can find the package Comparison Screen. Once the Agent will click on Upgrade now button, it will show what is the current plan of the Agent and also it will display all the plans, you can select any of the plans and can upgrade the plan as per requirement. Here, on this Package comparison screen you can Select the plan you would like to buy, also can add agents to your plan and click on “Upgrade Plan”, you final payment details will be displayed , also you need to enter the payment method you are willing to pay with and Finalise the payment.